You technically don’t need a company in order to be a consultant, but it helps you look more professional to have an actual, incorporated company. Plus it is important to keep business and personal finances separate for tax and other reasons. In the US, an LLC is probably the easiest type of company to form. Incorporating can be easily done online for just a few hundred dollars. The very first thing you’re going to need are customers. So how do you get them? First, start local. There are probably plenty of businesses in your local area that would benefit from your expertise. You may even have contacts at companies you’ve previously worked for, or people you have previously worked with. Don’t send a generic form-letter email offering your services to these companies, personalize it to specific tasks or offers of assistance that you feel would benefit them. These days every area of knowledge has one or more support forums, Facebook groups, and other places where people gather to discuss a particular area of knowledge. Go there regularly and answer questions. This will help you get known as an expert and thought leader within the community. In addition to this, start and maintain a blog with relevant topics. Promoting your blog and sharing it on social media is a free and simple way to get your name out there. After doing these things for a while, you may be surprised how many clients end up contacting your directly. Speaking of which, if you do a lot of work with a particular product, be sure to get in touch with the vendor to see what services they provide. Often there will be a way to get referrals or to get listed on a consultants list. Google Searches for the the product can also prove fruitful, as can Craigslist searches. Lastly, you can always try job and project posting sites such as Upwork or Freelancer, though these places often cater to the lowest bidders and are not great ways to get quality, long-term clients. The best way to retain the customers that you have found, and to ensure you have projects that go well for everyone involved, is to build solid relationships. When courting a client, don’t just send cookie-cutter estimates and project proposals. Take the time to talk with the client and understand their problems. Understand how they communicate. Don’t discuss project specifics or pricing right away. Save that for later, after you know the client better. Once you have a quality relationship in place, the client is far more likely to want to work with you. And more importantly, they’ll be far less concerned at specific rates and prices when you put together an actual proposal. With a good client relationship, everyone is happy. Now that you have a relationship, you are ready to submit a proposal to the client. There are lots of ways that you can create a proposal. It can be a more formal contract that describes the specifics of the project as agreed, with estimates, rates, schedules and lots of legalese. Or you can create a more informal proposal that outlines the basic problems and describes the ways you will help solve the problems. It may include high-level schedules, rates and other information that might also be in a contract. Regardless, it is always good to provide the client with a few different options that offer ways for you to increase the value of the project for them. For example, if you’re developing software for them, you could have Option 1 be the software deliverable itself, Option 2 could add training for an additional cost, Option 3 could add training and a companion product for even more cost. You may find that the customer, because of your strong relationship, agrees to an option that brings you more revenue because they want the extra value you’ll provide. Either way you should always end up with a contract that spells out what your responsibilities are, what the client’s responsibilities are, what the deliverables are and when they are due. Having everything spelled out clearly will help you to avoid unnecessary conflicts. People always ask what they should charge for consulting. There is no single answer for that. First, you need to decide if you are going to charge hourly or by the project. Each of these have pros and cons. Hourly billing is precise, convenient and easy to manage. But you are always limited by how many hours you can work. And don’t charge too low of a rate! Your rate should take into account that you will not likely bill a full 40 hours per week and it will need to take into account business expenses such as vacation, taxes, health insurance, etc. Some clients do not like hourly rates as they feel it does not give the consultant an incentive to finish the project quickly. This should be less of an issue if you have a good relationship to start with, but there are times you may want to consider a project-based price. The best way to price a project is based on the value the customer will receive from it. Although it can be tricky to figure out this value, it can allow you to price a project at several orders of magnitude over the actual hours spent creating it. Another option is to base the project on an estimate of the total hours and agree to stay within a certain range of the estimate. This is risky because estimating some types of project (such as software projects) is notoriously difficult and projects often take longer than estimated. And many [read: most] clients ask for additional work after the project starts so you’ll have to be careful how you manage that so that you do not end up doing extra work for free. Regardless, always remember you are providing value to your clients. Do not think of yourself as a commodity. Be sure to invoice regularly. If you are doing hourly rates, then invoice once a month (and try to insist on Net 15 — payment within 15 days). If a customer is late on payments, halt work so that you do not end up in a situation where you are owed too much money. It’s amazing how quickly a payment can move through the Accounts Payable department when work on the project comes to a halt. No matter how you charge for the project, you should always get a deposit up front. This can be a fixed amount or a percentage of the project total. Your proposal should have some sort of schedule in it. Everyone knows that schedules change, so the best way to stay on top of that is to provide regular updates. Don’t just take money, disappear for weeks (or months) and return with something. Or worse, don’t return after weeks, telling the client you need more time. Instead, keep the client updated with progress. Get them regular builds that they can test. They may not look at them, but they’ll be happier knowing that work is progressing. Also, keep the client engaged. Even if you think you understand everything, you can ask the client questions about small things that won’t impact the project as a whole (e.g., button labels or icons), to keep the client feeling involved and up-to-date. Happiness is about having one’s expectations met or exceeded. You can do this by having honest and regular communication with our clients. Happy clients pay their invoices on time! Always remember that you are the expert. If you are just implementing exactly what the client tells you, then you are probably not adding much value over what the client can get from a freelance job site. Instead, bring your expertise to the table. Be a good communicator, offer suggestions, understand their business. Your client depends on your knowledge and expertise, so always provide it. This often means that you don’t blindly make every change requested by the client. They are not experts in your field of knowledge and are probably not the best people to offer ideas on the best solutions. Their job is to accurately articulate the problems they are having that you are there to solve. If you have a good relationship with the client, you’ll be able to understand why they are asking for something and be able to provide better suggestions for how to accomplish it. When you are just getting started, you may not feel like an expert. You may question how much value you are bringing to the table. The reality is, if you are being paid to do something, you’re an expert in that field. You don’t have to be the the keeper of all knowledge and wisdom. You just have to know enough more than the client does such that they are willing to pay you for your knowledge. 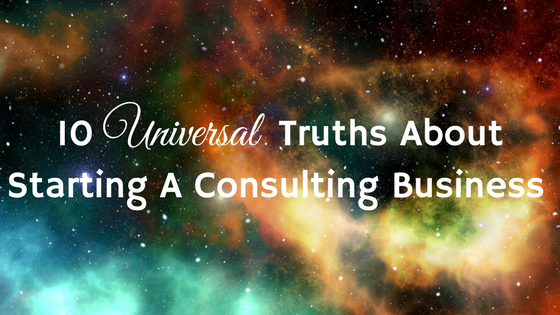 Revenue from consulting is not always consistent. You’ll have months where you are absolutely swamped with work and you’ll have months were you are actively looking for work. To help stabilize your revenue, it is helpful to have complementary product or services. Perhaps you can sell a product you’ve created, offer training or sell books. Each of these can provide passive income that can help supplement cash flow. Not all relationships work out. Sometimes you have to let go of clients. Perhaps you are not able to communicate with your client effectively. Perhaps they are far too demanding and are making your life miserable. Or perhaps you just no longer have time to adequately handle their needs. Whatever the reason, if it turns out the client is not worth the trouble, let them go. But always be professional about it. Perhaps you can refer the client to other consultants or places where they can find someone to help them out. Always ask your clients for referrals and recommendations. LinkedIn is a great place to display credentials and has a nice mechanism for gathering recommendations. Potential new clients always like to hear that you have successfully helped others. Additionally, as projects near completion, ask your clients if they know of anyone they can refer to you for consulting work. Assuming the project went well, they will be more than willing to put you in touch with other potential clients. Bonus Tip: If you find yourself in the enviable position of having too much work, you have a choice to make. You can either expand your business by hiring employees that you can bill out as experts or raise your rates. Yes, you read that correctly. Consulting is supply and demand just like anything else. If the demand is higher for something that the supply, the price goes up. Worst case, you’ll simply be earning more for the same amount of effort. That’s not a bad deal. Follow these 10 truth and success could be yours! It will take lots of hard work and likely long hours but the benefit to being your own boss is immeasurable. And don’t forget to have fun and enjoy the flexibility. One big benefit of doing consulting is that you control your own destiny. Do you need to run out to your kids’ activities during the day? That’s not a problem because you can easily work at night instead. Want to earn more money? Then take on more clients. Want to relax in the summer? Schedule less work in July and August.